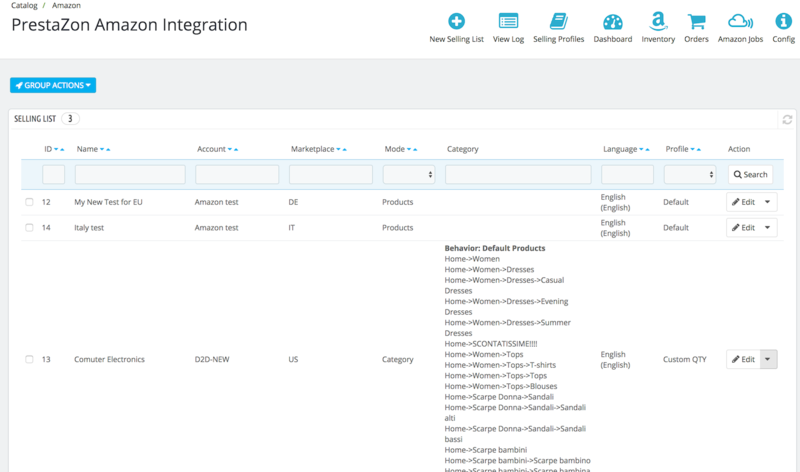 We are happy to announce a beta release of our PrestaShop Amazon Integration module. The module allows you export your PrestaShop products to amazon marketplaces, import amazon orders into PrestaShop, synchronize stock level. During testing period module available for a free usage without limitation. The testing period will take place until 22 July. 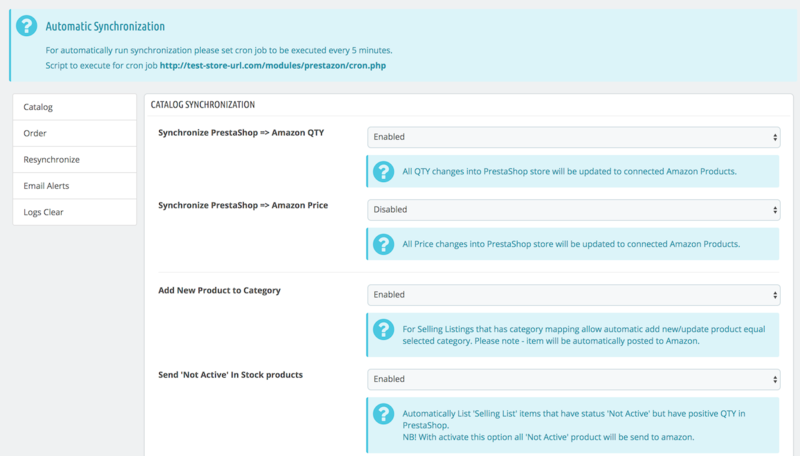 Detailed information about the PrestaShop amazon module, request for the test you can find in the dedicated page on our website — PrestaBay — PrestaShop Amazon Integration. Bellow, you can find features list supported by the module. The module allows you export your PrestaShop product to amazon marketplaces. PrestaShop products should have SKU and EAN/UPC code. Please notice module currently not support creating new ASIN code, so your product should be known by amazon. 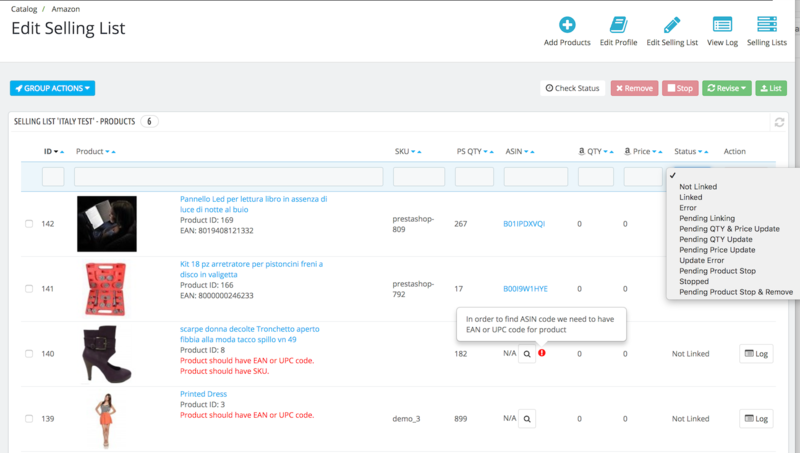 In version 1.3.x we plan to introduce creating new ASIN code by your PrestaShop products. The product should already exist on amazon. Creating new ASIN code not supported by module yet. Support is planned to version 1.3.x. Important! The module does not support exporting variation products to amazon. Support for variation products is first priority feature. We plan to introduce this feature in module version 1.1.0. Supported marketplaces: Amazon UK, Amazon DE, Amazon IT, Amazon ES, Amazon US, Amazon CA, Amazon MX. The module gives you the possibility to import Amazon orders into PrestaShop store. In order to see order inside your PrestaShop store orders, few requirements should meet. As soon as you change the status of PrestaShop order to "Shipped", the module will send the corresponding update to Amazon and notify buyer about his purchase been shipped. Important! The module currently not fully support Amazon Fulfillment orders. Access to Amazon Fulfillment features will be available in 1.2.0 version of the module. PrestaBay — PrestaShop Amazon Integration module has the possibility to import your current amazon inventory into the module. This allows automaticly match SKU to ASIN code, give you an overview of all products available in amazon marketplaces. For the following module released planed moving these inventory products into PrestaBay module Selling List and also direct management all inventory from "Inventory Page". 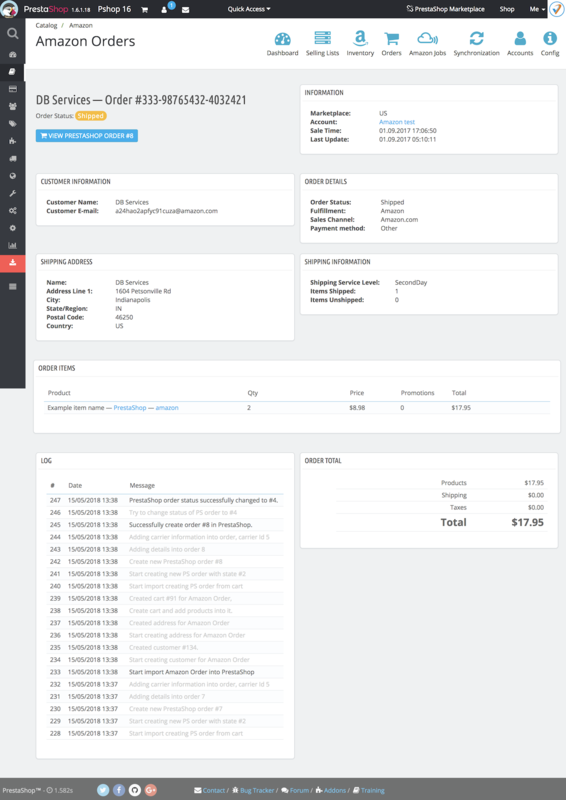 Inside Selling List module have a feature that allows you find corresponding amazon products by providing item SKU/EAN/UPC code. If the request to amazon successful and item found, you will be possible directly access item view page from Selling List page. Additionally, Inventory import will try to match amazon inventory items to PrestaShop products. If this match was successful you will see item ASIN code inside Selling List. The module comes with automatic synchronization executed by a cron job. For successfully use a module it's required to set automatic synchronization run every 5 minutes. Depending on execution time module will execute certain synchronization tasks. For example "Order Import" function executed every 5 minutes, same time "Order Fulfillment" executed every 15 minutes. Automaticly send all products to Amazon task calls every 30 minutes. Please let us know if your hosting does not support execution of cron job every 5 minutes, we will help you with configuration. "PrestaShop Amazon Integration" module uses the same approach as we use in "PrestaShop ebay Integration" module. Module available under menu "Catalog—>Amazon (PrestaBay)". Selling List — represent a group of PrestaShop products prepared for amazon export. Every "Selling List" could be in two modes: Product and Categories. For "Product" mode you need to select specific products to add to Selling List. 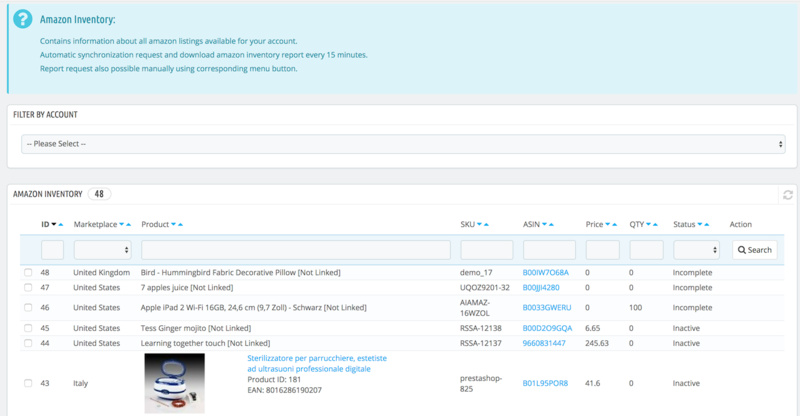 With "Category" module all products from selected categories will be added automaticly to Selling List. Also, new products that you add into PrestaShop categories, will also appear inside this Selling List. Selling Profile — represent a group of settings for Selling List. For amazon module, these settings mostly about exported products QTY, exported price, currency conversion. Amazon Inventory — contains information about all amazon listings available for your account. Some of this items could be available on Selling List, some of them not. Amazon Jobs — list of request/operations send to amazon. Amazon Marketplace Web service (MWS) api required most of the operation executed in the background. In this page, you can see a list of all request send to Amazon MWS that required background execution. Some of the example of such jobs: Amazon Inventory download, Orders Fulfillment, Sending Products, Update Products QTY & Price. Synchronization — list of available synchronization settings in the module. 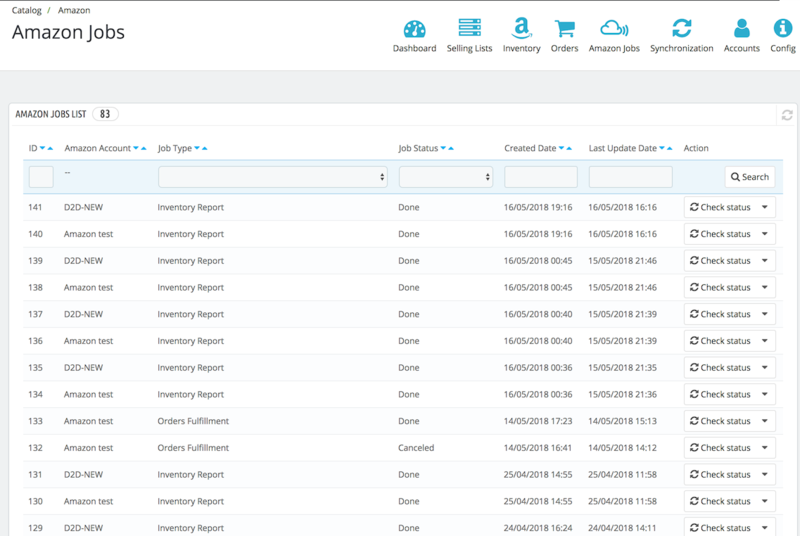 This section includes stock level synchronization configuration, order import, GDPR settings, the configuration of automatic products export.